Any physical object can affect sound waves; acoustic metamaterials are engineered with specific properties, allowing for precise manipulation of sound waves. focus waves to improve acoustic imaging capabilities. 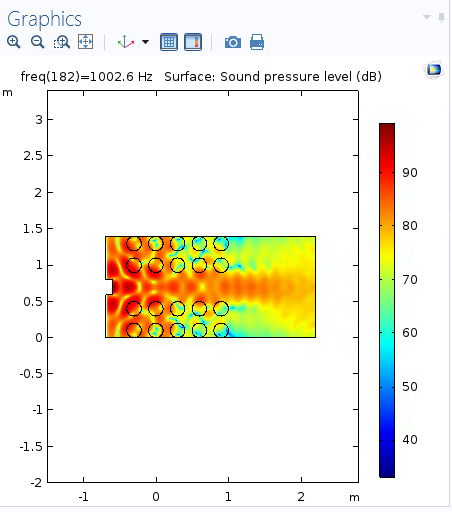 In 2013, Duke University created an acoustic metamaterial, DSMSomos 9420 Photopolymer [Figure 1a], to build an “acoustic superlens.” This focused a generated sound wave’s intensity to a specified point, which is useful for capturing a clearer acoustic image [Figure 1b]. Unfortunately, the process used a precisely-engineered metamaterial, which is difficult and expensive to create. Acoustic metamaterials rely on two aspects to achieve wave manipulation: geometric pattern and material properties. While this project intends to use Duke University’s superlens structure as a starting point, we believe that utilizing common plastics, with similar material properties, will help improve the commercial viability of metamaterials. We therefore intend to synthesize various plastics (eg. Acrylonitrile Butadiene Styrene (ABS) and Polylactic Acid (PLA)), and experiment to better understand their properties in an acoustic superlens. This project will also strengthen Cal Poly’s long-term acoustic metamaterials development and testing capabilities, allowing for further research into an under-developed and profitable market, while simultaneously connecting Cal Poly / AES to acoustics companies and industry leaders.